I have been hearing a lot about “wine and paint” parties…a fun new arts and crafts type class where the teacher prepares the canvas, hands out the paints and brushes, and then everyone in class paints the same painting. The teacher goes over the process one step at a time, and in just a few hours, the students leave with a beautiful finished painting. In our area, these classes have been hugely popular, thanks in part to Twyla Duke of “Art Fully Yours.” She makes learning to paint really easy — takes the drawing part out of the equation and has the patience of a saint. Her bubbly personality immediately puts even the beginners at ease. Some of the girls at the beach have been asking me to teach one of these classes (mostly because they love to drink wine) so Twyla invited me to participate to see how it is done. Twyla actually gave the group a choice of 2 paintings: an Easter sunrise and a landscape. I chose the landscape. She ran back and forth between the two painting groups without breaking a sweat.. I’m not sure how she managed that! For the landscape, we started at the top of the canvas and painted the sky, then the clouds and treetops. We worked our way down from there. In 2.5 hours, we had a beautiful landscape finished and learned a few new strokes to add to our painting skills arsenal. While painting, I made some new friends and had a blast. 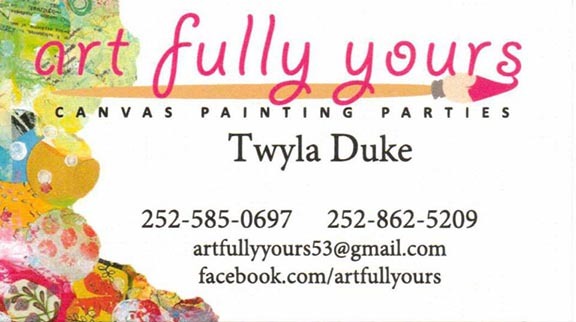 If you are interested in painting with Twyla and making a painting that is “art fully yours” check out her Facebook page at http://www.facebook.com/artfullyours. Thanks to Twyla for inviting me to attend and for letting me share her photos! Terri, Julie and I headed up to Newport News in the rain for a new adventure. Kat Allison, fiber artist, educator and adjective lover, invited us up (or did we invite ourselves??) for a fabulous day of weaving on the copper loom. The day started with show-and-tell of Kat’s lovely studio and artwork. Then we jumped in and started warping our looms. When Kat asked us what size loom we wanted, we all said BIG ONES so that’s what we got! Terri and I got scarf-sized looms and Julie wanted one the size of a small rug. Each was lovingly made of shiny copper by Kat herself. Her looms are special– when you take off the weaving, the warp threads magically disappear, making your piece almost finished as soon as you remove it from your loom. Experts say it can’t be done, but it works, and it is fabulous. Of course, weaving is not for folks craving immediate satisfaction. You have to put in the time, but it is worth it. On one of Kat’s looms, you can mix in fibers, beads, strips of hand dyed fabrics, paper, clay, wire and more– truly a mixed media adventure. I am starting with making a scarf of fibers, beads and fabric strips. It looks awesome so far, and feels yummy. I can’t wait to wear the finished product. When we get past the holidays it is the first project I will finish! I hope the New Year finds you happy and healthy. 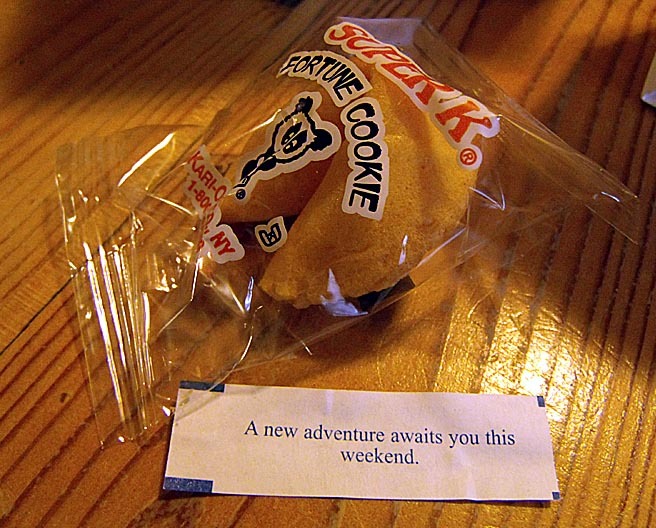 I also hope you will find new artistic adventures in 2015! What I loved: Playing with Kat is always an artful adventure! What I learned: Weaving takes time and patience, but the results are gorgeous! When weaving a scarf, I found it works better to warp the loom over every other peg. Also, the finished product is much softer and more scarf-like if you use yarns instead of fabrics. Paddleboarding from New York to Miami on a fundraising expedition.